Is The Samsung Chromebook Pro Overheating? If you’ve done any research on the Samsung Chromebook Pro in preparation for a possible purchase, you’ve likely seen the sparse accounts of the device overheating. Perhaps you’ve even dismissed the Pro outright on account of this. Well, we wanted to set the record straight on this device that, as I’ve plainly expressed, is perhaps the best Chromebook experience available right now. When we talk about overheating, I think there’s a chance we’re not all talking about the same thing. There’s heating up, which processors do. ARM or x86, processors get hot when they are under heavy load. Take the Google Pixel, for instance. If you drop it into the Daydream View and just do some basic navigation, the device gets really, really hot. Granted, I’ve not seen any performance hit, but the device gets what I would consider hot. Note, I didn’t say the device is overheating. Overheating would indicate that the phone is getting too hot to function properly. Perhaps the device shuts down, slows down, or bursts into flame a la Galaxy Note 7. That would be overheating. That would be unacceptable. That would be a real issue. After all the talk about the Samsung Chromebook Pro overheating while hearing nothing about the Plus having the same issues (and even having some contend that the Plus simply doesn’t get hot), we decided to test this all out. 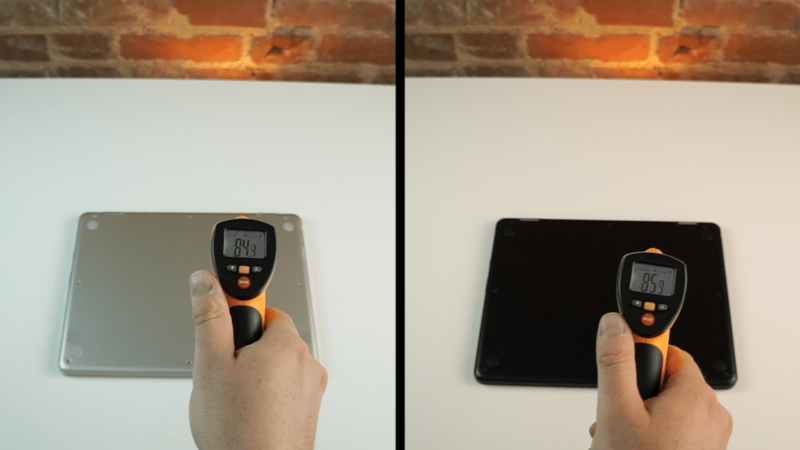 After each test was run, we used an infrared heat gun to detect the outer temperature on both the top and bottom of both devices. After all, outer temperatures are really the goal here. We never saw anything over 110 degrees Fahrenheit (43 degrees Celsius) on either machine, so it never even got to the point where most people call laptops uncomfortable. For those of you who don’t want to watch the video, just know that the two fared similarly in the testing with the Pro getting warmer in a couple of areas. This is to be expected, however, as a Core m3 is capable of much more processing power than the OP1 in the Chromebook Plus. More power tends to drive up the heat a bit. However, compared with the Plus, the Pro didn’t get that much warmer. Definitely not enough to claim this device is overheating. If you look closely in the video, near the end in the Google Earth test, I have Street View up and running on the Pro and it continued to run smoothly thoughout. By this point, the Plus had tapped out and I couldn’t get street view to actually load. Again, more powerful processors tend to create more heat, but being warmer doesn’t mean the device is overheating. I have to give the Plus some serious props, though. We had Shadowgun:Deadzone running at the highest graphic settings and at 60FPS and both devices performed admirably with zero dropped frames and graphic detail that is absolutely stunning. While we can’t test every Chromebook, we can say without a doubt that the thermals between these two devices are not different enough to warrant a change in purchasing decision. If you want more power than the Samsung Chromebook Plus has to offer, the Pro is a fantastic upgrade. Some folks will say it isn’t worth the money and, for certain people, I’d agree. If your use case is like mine, though, the Pro is worth every penny and is hands-down the best overall Chromebook experience I’ve had yet. Hope this video helps some of you make a more informed decision.